Sing along now to this beautiful song! Aruba, Jamaica, ooh I wanna take ya… to Bermuda, Bahama, come on pretty Mama … Key Largo, Montego, Baby why don’t we go… ooh I wanna take ya… down to Kokomo!! Bermuda and her littermates and mama (Bahama Mama) were rescued from horrific conditions in early June 2018. They were all quite scared when they came in, and a few of the kittens were in need of medication, but they quickly came around and started enjoying attention and interaction with their foster family! They have a playground of toys and huts to hide and play in and soft beds to lounge in … now they just need the purrfect family to find them and give them a loving home where they can continue to blossom! 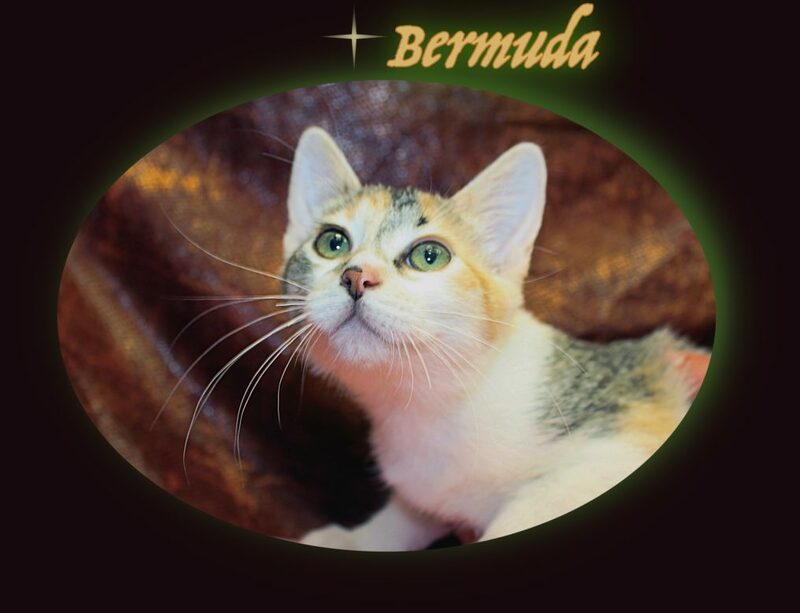 All of them have been adopted except Bermuda and her mama – so it’s their turn now! 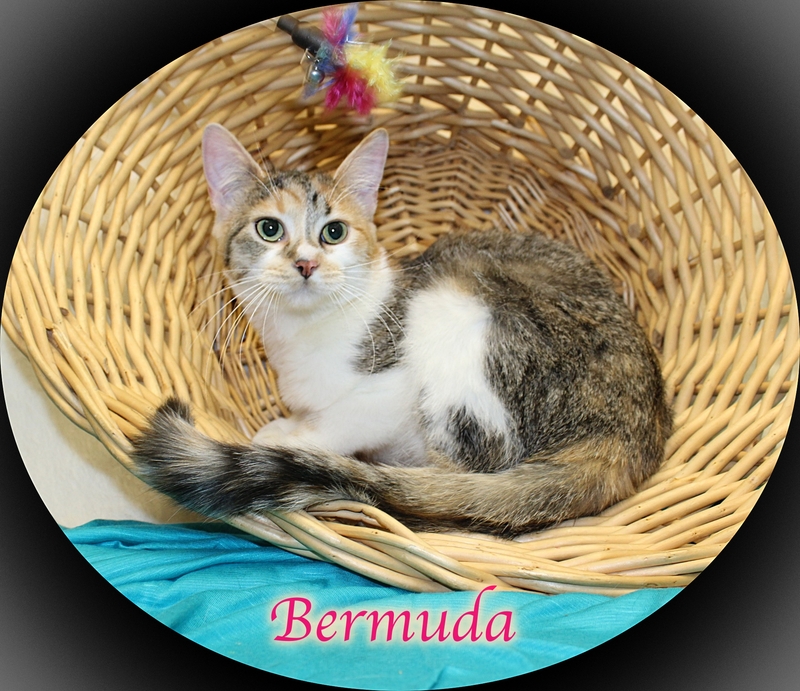 She is now 7 months old and still waiting… 🙁 Bermuda is a beautiful little Patched Tabby and White female… her coloring is very similar to Bahama Mama’s fur – her mama! Some people call any kitty with three colors a Calico – but a true Calico is mostly white with patches of solid black and orange/red. 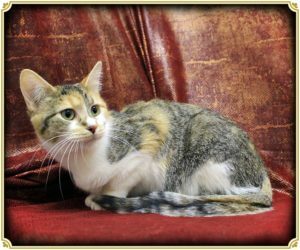 With any tabby markings in the colored spots, it is no longer considered a true Calico… So with all the tabby markings in her blackish parts of her fur coat and in the ginger/yellow spots as well – in the ‘cat world’ she would be known as a Patched Tabby and White! She was the most shy of all the kittens but she’s doing great now and loved to snuggle with all of them! She is very sweet and with love, care and tenderness, she should be great with any family, too! She is now very friendly with and loves to snuggle with Buster, so if you are looking to adopt a pair of kitties who know each other… check out our handsome longhaired black boy! Bermuda’s adoption fee is $100 which includes spay surgery, being up to date on vaccinations, and a microchip with lifetime registration. If you’re interested in this unique beauty, please complete an application HERE or email adoptions@adopthope.org.